A pun is a form of wordplay that uses multiple meanings of a word or phrase for a humorous effect. Homophones are words that sound the same but have different meanings and different spellings. This worksheet combines both of these concepts. Your students will have fun identifying the homophones in these hilarious puns! For more practice with puns and homophones, use Puns with Homophones #2. Puns offer kids the chance to have fun with figurative language! Your students will giggle as they find homophones in each of these silly puns. In this lesson, your students will get a laugh as they study the homophones and homographs in funny puns! This is a great worksheet for students to practice identifying and using homophones as they work to create their very own puns! In this fun worksheet, students will get to practice using both homophones and homonyms as they identify and write puns! 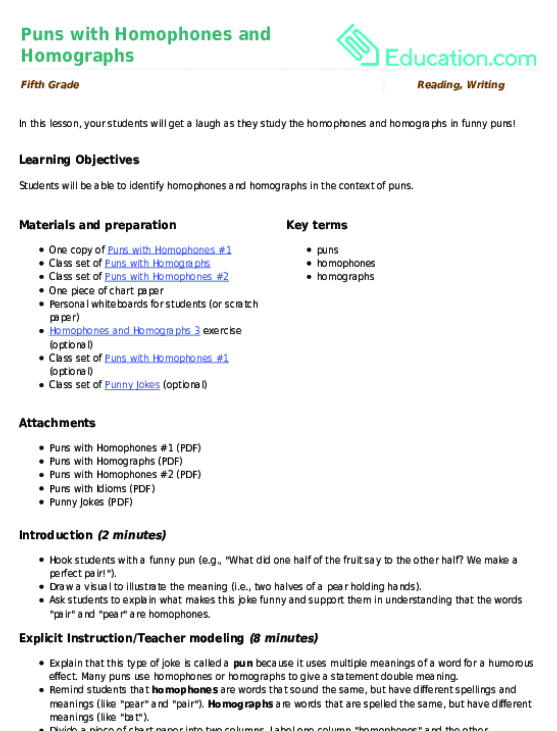 Use this worksheet to help students practice understanding homophonic puns. Engage your students with food puns to jazz their appetites and brains! Use this worksheet to provide students with even more practice using both homophones and homonyms as they identify and write their own puns! Introduce your students to visual puns with these fun images! Then, challenge them to come up with their own visual puns. Challenge your students to find the definitions of each homograph that give these puns their double meaning. Engage your students with eggciting wordplay and food puns! Help students understand homographic puns and how to use them. Give your students exposure to funny puns related to animals!